Attendance Works and Everyone Graduates Center, September 2016. 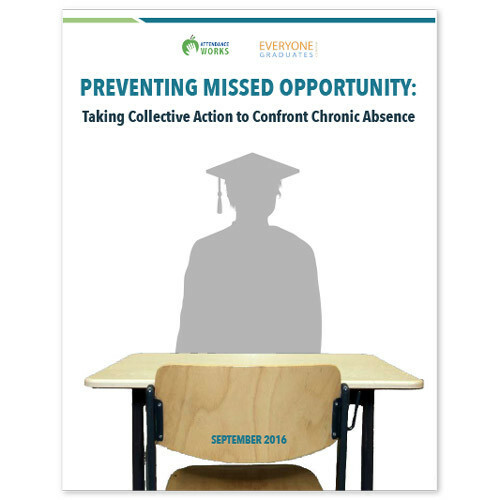 This brief, Preventing Missed Opportunity: Taking Collective Action to Confront Chronic Absence, builds on the first national chronic absence data from the U.S. Department of Education’s Civil Rights Data Collection from the 2013-14 school year. The analysis finds that half of the 6.5 million students who are chronically absent nationwide are concentrated in just 4 percent of school districts. The analysis also shows that chronic absenteeism follows poverty wherever it is found in significant concentrations. Given the scope of the problem, the brief lays out key steps school districts and states can take to turn around chronic absenteeism by using real time data to trigger collective action to ensure every child has the opportunity to achieve in school. An interactive Chronic Absence Data Map created to accompany the brief shows highlights of the analysis as well as a snapshot of the some of the school districts most affected. Attendance Works has created a guide for accessing the 2013-14 CRDC to help filter the data for your state or LEA. Click here to find the guide.